From gala dinners to corporate receptions, events under Concorde is a truly unique experience, so book now and enjoy great food and entertainment at Bristol’s newest and most unique and exciting venue. 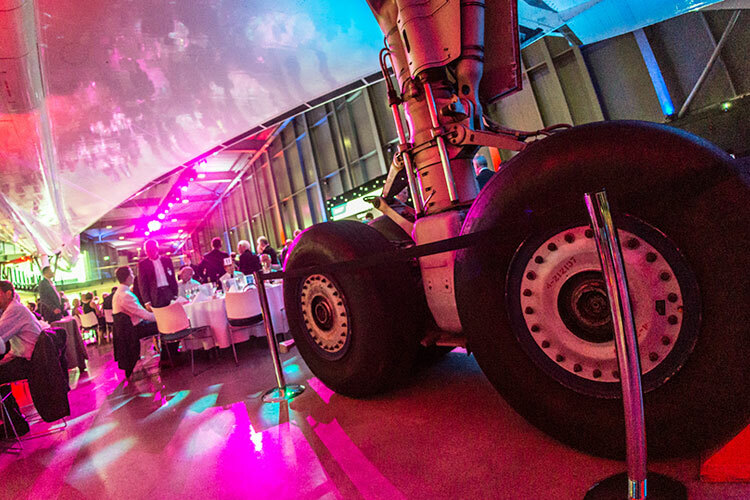 For a corporate event or dinner reception with a difference, dine under the wings of Concorde at Aerospace Bristol in her fiftieth anniversary year. Events at Aerospace Bristol are like no other. Begin your reception with drinks and canapés on the balcony overlooking the last ever Concorde to fly, before you take your seats for a first class dining experience under the wings of this iconic jet. Your guests can also enjoy exclusive access on-board Concorde, ensuring that your special event will be a unique experience to be remembered and enjoyed by all. The Concorde Hangar is ideal for any event, whether you are hosting a conference, gala dinner, awards ceremony or celebration party, we are here to help create the perfect event for you in the most unique setting.